You should have a letter for Moodon, the Moogle at the Inn in the Business District, if you've been keeping up with Mognet. He also has a letter for Zidane from Ruby, and will ask you to take a third letter to Moonte. The far north of the Business District is blocked by rubble. Check the rubble for a Lindblum Card. You can get an Ether and a Phoenix Pinion from the house to the right of this heap of rubble. Minister Artania is in the Business District's shopping area, in the northeast. Going there will force you into a cut scene with Regent Cid. He'll give you 3,000 gil to prepare, and send you back to the shops, where you can purchase and Synthesize a much larger variety of items. After leaving this area you'll get an ATE, The Third Jewel. The Industrial District has been destroyed. Whoops. No more going there. You can't go to the Castle, either, though you'll get more chances to do so later in the game. Check the artist's home in the Theater District (right by the Air Cab station) to find an Ore in a chest. The Tantalus HQ in the Theater District has new chests containing 340 gil, 262 gil, and 993 gil. Standing outside the HQ is Lowell, the actor, and you can tell him about Ruby's theatre in Alexandria to send him packing. Speak to the guy Artania left behind in the Business District when you're ready to leave and you'll get vaulted out of Lindblum. You cannot turn back after speaking to the man, so be certain you're set to go. In the intervening cut scenes you'll receive a World Map from Cid and wind up at the Dragon's Gate, where a merchant waits. The Moogle in here, Moonte, will happily accept a letter from Moodon, if you brought one along. - Head north from Lindblum to Fossil Roo. 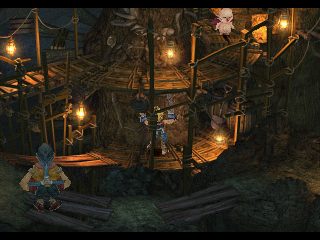 Here, in the north, you'll find Quina, who survived the events of Cleyra - assuming you recruited Quina at the time. If not, catch a frog, then speak to the lumpen chef to recruit him/her to your cause. - Head north until you find a house, then take a right. 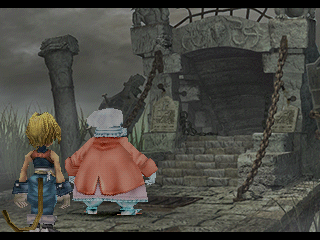 You'll hit a cut scene, and Quina will find something: the entrance to Fossil Roo, the next dungeon. - Upon entering Fossil Roo and walking a little ways you'll come under pursuit by Armodullahan, a massive, armoured creature. It will chase you through an area full of traps, and if at any point it catches the party you'll have to fight it temporarily. A zap of Vivi's Thundara is usually enough to throw it off and allow escape, though you'll fight it forever if you don't keep running. Eventually Armodullahan will fly into a chasm and you'll be free... to fight someone else instead. 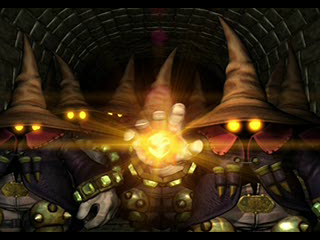 Though not the strongest boss you'll fight in Final Fantasy IX by far, Lani is no slouch either. She uses a combination of physical and magical attacks to assault your party. 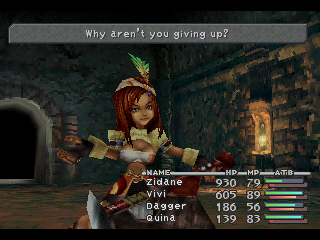 Thing is, she expends most of her effort on Dagger, only occasionally attacking your other party members (unless they hit her physically, in which case Lani will happily counter their hits). You can take advantage of this by casting Protect and Reflect on Dagger to both defend against Lani's assault and strike back at the bounty hunter. Other than that, physical attacks and spells from Vivi work nicely. Note that Lani will swap her attention to Vivi if Dagger goes down during the fight. Zidane can Steal an Ether, a Gladius, and a Coral Sword from Lani. - Lani flees after the battle, allowing you to properly explore Fossil Roo. Head west in the next room and you'll find a large flower; interact with it and walk a few feet to the right to bring a Gargant running over. You'll use Gargants as your primary form of transportation in this place. Grab food, then walk around the area until you find an exclamation point indicating that you can summon a Gargant. - Head northeast into the next room over. A Treasure Hunter here will explain how Gargant travel in Fossil Roo works. After listening, go down the stairs on your left to find Mogki, a Moogle with a letter to read (but nothing to deliver) and a shop, and Stiltzkin, who will sell you a Phoenix Pinion, Remedy, and Ether set for 555 gil. Continue down the path from the Moogles onto another screen to find a Gargant station that will usher you to a chest containing Fairy Earrings. - Head back to the room with the Moogles and exit through the northeast. The Gargant here will take you to a switch; hit it, then get on the Gargant again. This time it will take you to another isolated area. Go up the stairs and head north to find an Ether, then head back down the stairs and go north. You'll be guided to the first switch you saw, in the room with the Treasure Hunter and the Moogles. Flip it, go all the way back to that same room the way you came (you'll have to flip the previous switch again that got you here), and take the Gargant that took you to the Fairy Earrings earlier. - You get dropped by a Treasure Hunter who will sell you stuff. Head up the stairs beside the Hunter and you'll find a switch and a passage on its right. Hit the switch and the Gargant in the next room will take you to a Lamia's Tiara; ignore the switch (or hit it a second time) and it will take you to the next area. - The next room contains a huge wall covered in ivy, and if you try to climb across a statue in the wall will slap you down into the pond below with a gout of water. You can climb onto the ivy and go up and around to the upper left to find a switch which will warn you that you're almost at the end; hitting this switch will prevent you from backtracking. If you have any business on the Mist Continent, don't hit this switch. Mine long enough and you can find a Madain's Ring. This can take quite a while; just keep hacking away. 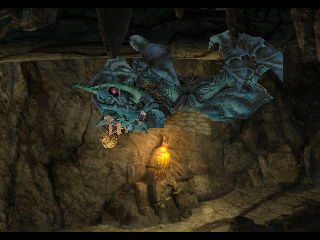 If you smack the rubble along the left side of the upper level of the dig site enough times you'll release a Moogle named Kuppo. He has a shop, and will give you mail for Kupo. Once you're done mining, exit to the left of the Treasure Hunter. This takes you to the ivy wall. Hit the no-going-back switch and use the Gargant that took you to the mining wall earlier. The Gargant will usher you away from Fossil Roo and onto a brand-new continent.